Can the global health community meet the needs of the world’s most disenfranchised people? Global health law and policy expert Lawrence Gostin believes it can, through an international convention focused on the least healthy among us. Titled “Meeting the Basic Survival Needs of the World’s Least Healthy People: Toward a Framework Convention on Global Health,” the lecture combined health law, human rights, poverty, international trade and intellectual property subjects. Gostin explained how the international health landscape is increasingly crowded and complex, and that when global health efforts overlap, results are fragmented, and activities cease to align with country priorities and capacities. He noted that global health funding and interventions are skewed toward emotional, high-visibility events, such as the Asian tsunami, as well as toward diseases that capture the public’s imagination (like HIV/AIDS), or that have the potential for rapid global transmission, such as SARS and influenza. Gostin argued that, instead, what is truly needed is to meet the basic survival needs for the world’s most disadvantaged people, through a Framework Convention on Global Health, which he is involved in developing with various international bodies. 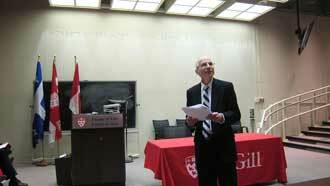 Campbell was also quick to point out the crucial support received from the Beatty Memorial Lectures Committee, which exists to support public presentations delivered within the McGill community by leading international scholars, and co-sponsored the event as part of this mission.